All I can say is that I waited for eight years for mission scripters to start to show up in the community, and when they eventually did they all started their own projects rather than join anything existing with campaign ambitions. Q1: What is the use of the Fighter, Corvette, Frigate and Capital Ship, when we have the availably of them already. Q2: What the point of using a marine frigate when’s the Salvage Corvette’s does the extract same thing and their 6 of them. They are capable of doing the same thing, why change it. To me it doesn’t make any sense!!! Q3: I noticed that you have put a Hyperspace Module on the Mothership/Carrier. Why do this? I mean the Taiidan/ Kushan were perfectly capable of hyperspacing at the start. Why build a module just to get hyperspace. For me it doesn’t make sense. Can you explain it to me. Q4: Why change the powerful Taiidan Heavy Cruisers to Battlecruisers. If you answer these questions it will help me to understand your ships a little bit better! Thanks for everything and continue to provide content for the Mod! Hey while I’m not officially working on this mod I do aid them with play testing and by providing ideas for their sp missions. All these questions are good but could get easily answered in 1 answer. These Taiidan are Republic Taiidan. They broke away from the Imperial Taiidan for one thing. The 2nd thing is that this faction is based up upon the HW2 timeline. And in that timeline we’ve got Supply modules instead of the HW1 way. So seeing how the missions will play during the Vaygr war it makes sense for balance adjustments to take the HW2 approach of things. Q1: The models are different what kind of question is that? ^^ In a certain way you’re right of course but don’t you like to see tons of new factions to play with? If all got few extra goodies along the way to make the fights with and against them slightly different and epic then I’m all for it. Q2: HW2 factions utilize frigates instead of corvettes and capture on spot instead of bringing ships back to their mothership. I suppose since the Taiidan Republic is an ally with the Hiigarans it makes sense for them to exchange certain technologies and combat tactics with one another. Same from me. Thanks for the hard work the modders are putting into this mod and any other mod out there right now. It keeps the game interesting. I’m sorry that I have to be the one to break it to you, but you are dead. The taiidan republic mod takes place over 100 years after the exiles returned to their homeworld. Hm who knows for sure???.. Karan Sjet is still alive in hw2 is she not ? Guess they freeze her after every major event conclusion. Karan Sjet is still alive in hw2 is she not ? Guess they freeze her after every major event conclusion. I can’t remember if that was from a canon source, though. However, I think I also saw another explanation that the Karen S’jet from HW2 is a direct descendant of the Karen S’jet from HW1. Or it could also be used as a title within the S’jet sect. About asteroid’s name, is there some ideas ? Is there background about ? Out of curiosity, what are the missions scripted in? Is there somewhere in my HW:RM installation I can take a look at a mission script quickly or do I need to unpack some files? @ everyone else, the February Update is here! Ps: Don’t save such images as Jpg. You usually lose quality when using jpg, especially when re-saving after making modifications. Best to use TGA and PNG. Personally I like the idea that the Asteroids had names… These are the tiny details that differentiates a SP mission of a mere skirmish map. Alright we can name the asteroids, but that’s a lot of name-thinking to do… Hit me with your suggestions! role : cause allys necessarily know the function of an asteroid … we will not buy a propeller in a civilian area. Basically it’s the same reading for the modules, the name and the description … same way, HW spirit. the asteroid of the central command of communication can not be named … it would be necessary to unblock the option to him. concerning february update, introduction now very short… before we had time to look at the scene with the carrier’s approach … we no longer have atmosphere and contemplation: bad trip. The introduction is not playable, it’s IMPORTANT to transmit the atmosphere HW + mod. It is the spirit that’s proposed, the timing of this version has none… People have to immerse themselves inside the game. Give like 1 minute of travelling ! New view nice. I think in that aspect was it sufficient to name them Alcagaran city Asteroid or what ever name they had. If for what ever reason you truly go with names: Then I’d limit it to like 3,4 larger asteroids while the rest keeps their current name. Wouldn’t necessarily even require grandiose names. You could also go in a more militaristic style with simpler names provided by their IFF. Administration and control facility, Alcagaran hydroponics hub asteroid, power plant sub-link 01,02 etc… Basically show casting numerous segments of the greater good equals the whole city with each asteroid serving a specific purpose for that city. Using religious names or other more prominent names may just confuse the players as to the purpose of that asteroid and whether it plays a significant role in the mission or not. Assuming you get the ulitility platforms finally to work as intended I’m all for it and in love with them. If not I think you should properly divert from this idea and go with regular controller ships while maintaining the stations as unique SP campaign assets. 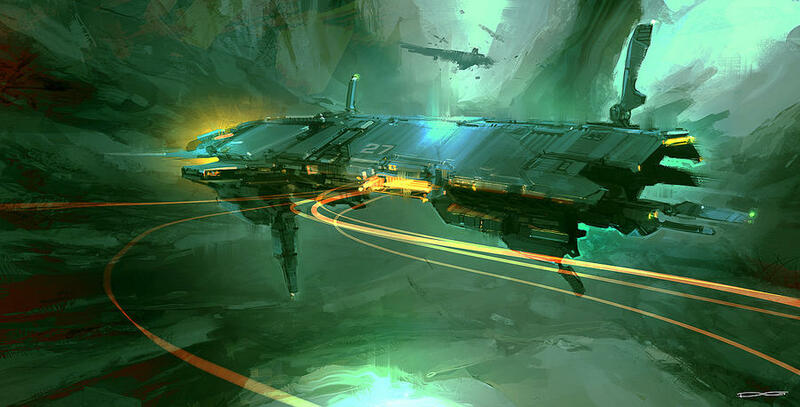 As for the 2nd concept art picture. I don’t mind the top fins at all. Not the very least in fact. What I mind about is more the whole station itself… It seems more appropriate for Hiigaran Style than it does for Taiidan. I would rather like to see Station models for the Taiidan based up upon the cinematic of the SP campaign that showed us an easier access point into Taiidan space. Looks great! The openings feel authentically HW2 because they remind me greatly of the tunnel/entrance/hangar bits in the Gehenna asteroids, and the overall form is strongly reminiscent of the Research Station, but with unique features and form. I think it’s excellent! They are actually working quite well now according to my testing. Some modifications to the scripting are in the pipeline as well. I have only had one bug report about platforms recently, and that was not reproduceable. If you spot anything, as always, give me a shout (preferrably with a log file).